Many homeowners love hardwood floors not only for their look and durability, but also because they’re simple to clean — at least relative to carpet, tile, and many other surfaces. 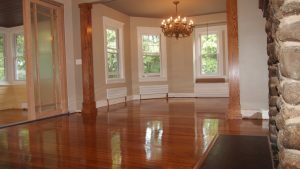 But maintaining spick-and-span hardwood floors isn’t quite as simple as it may seem, which leaves many homeowners wondering: What’s the best way to clean hardwood floors, anyway? Your first line of defense is to remove dirt and debris as quickly and often as possible. Even the smallest specks of dirt act like sandpaper, and can scratch the floor’s surface and make it look dull. So make sure to vacuum or sweep regularly — ideally once every two to three days, or more for high-traffic areas, says Miller. If you vacuum, use the hard surface setting on your machine, which turns off the beater bar and lowers the vacuum to the floor for better suction power. Hardwood floors may look impervious to spills compared with carpet, but certain substances can actually eat away at the top coat of polish on your floor. Some common offenders include milk, mustard, and pet urine. So if Fido or Fluffy isn’t fully house trained, make sure to pick up after accidents pronto. The result? Your floor might look shiny right after you’re done, but it will quickly smear and look dull (prompting you to clean your floors again). So when in doubt, stick with cleaning solutions recommended by a hardwood floor specialist rather than what’s being hawked at your average grocery store. If vacuuming and mopping don’t restore the luster to your hardwood floors, it may not be due to lack of elbow grease. Eventually, wood floors withstand enough damage that they should be refinished — meaning the top layer of wood is sanded down to remove marks, then covered with sealant. Hardwood floors should be resealed about once every 10 years, or every two to five years if they get substantial traffic from kids or pets.